In recent years, the military retirement system has become a bit more complicated. Here are some basics to help you understand what to expect. Who Is a Retired Military Member? For Navy and Marine Corps members, you are considered to be a "retired member" for classification purposes if you are an enlisted member with over 30 years service, or a warrant or commissioned officer. Enlisted Navy and Marine Corps members with less than 30 years service are transferred to the Fleet Reserve/Fleet Marine Corps Reserve and their pay is referred to as "retainer pay". Air Force and Army members with over 20 years service are all classified as retired and receive retired pay. When a Navy or Marine Corps member completes 30 years, including time on the retired rolls in receipt of retainer pay, the Fleet Reserve status is changed to retired status, and they begin receiving retired pay. The law treats retired pay and retainer pay exactly the same way. Military retirement pay is unlike civilian retirement pay systems. You either qualify for retirement by honorably serving over 20 years in the military, or you do not. Another significant difference between military retirement and civilian retirement is that a retired military member can be recalled to active duty. The chances that a military retiree would be recalled to active duty after age 60, or who have been retired for more than five years, are slim. DOD categorizes retirees into three categories, with category I as the most likely to be recalled to active duty, and category III as the least likely. Individuals over the age of 60 are in category III, which is the same category as individuals with disabilities. Recall of category III retires is extremely unlikely. For members who entered active duty or on prior to September 8, 1980, retired pay amounts are determined by multiplying your service factor (normally referred to as your "multiplier") by your active duty base pay at the time of retirement. If you entered active duty after September 8, 1980, the base pay is the average of the highest 36 months of active duty base pay received. Additionally, your initial (first) cost-of-living adjustment will be reduced by 1 percent. The "multiplier" for the above two plans is 2.5 percent (up to a maximum of 75 percent). For example, a person who entered active duty on or before September 8, 1980, and spent 22 years on active duty, would receive 55 percent of his/her base pay as retirement or retainer pay. A person who entered active duty after September 8, 1980, and spent 22 years on active duty, would receive 55 percent of the average of the highest 36 months of active duty base pay. If you are a commissioned officer or an enlisted with prior commissioned service, you must have at least 10 years of commissioned service to retire at your commissioned rank. If you have less than 10 years of commissioned service, and voluntarily retire, you retire at your enlisted rank, and only the highest 36 months of active duty enlisted base pay counts for retirement computation. There is a third retirement system for anyone who joined the military on or after August 1, 1986. These individuals are required to make a decision at the 15-year point of their careers. They can elect to participate in the same retirement program above, or they can choose to receive an immediate monetary bonus ($30,000), and select the "REDUX" system. If they elect the "REDUX" system, the factor is determined by taking 2 1/2 percent times your years of service then reducing that factor by 1 percent point for each year less than 30 years. Using the same examples as above, a person with 22 years of active duty service would retire at 47 percent of the average of their highest 36 months of base pay. The "REDUX" ends at age 62, and the individual then begins to receive his/her "normal" retirement pay. Additionally, folks who elect "REDUX" will have their annual cost of living allowance reduced by 1 percent. At age 62, those percentage points are added back to the retired pay, however. For all plans, years of service includes credit for each full month of service as one-twelfth of a year. "Years of service" for officers includes all active service, periods of inactive reserve service prior to June 1, 1958, ROTC active duty time prior to October 13, 1964, constructive service credit for Medical and Dental Corps, and drills performed while in the inactive reserve after May 31, 1958. 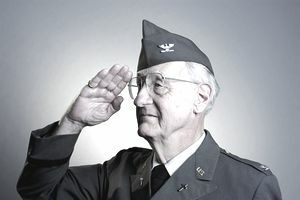 "Years of service" for Fleet Reservists and all other enlisted retirements include all active service, active duty for training performed after August 9, 1956, any constructive service earned for a minority or short-term enlistment completed prior to December 31, 1977, and includes drills performed while in the Active Reserves. Your pay will be computed according to provisions of the Tower Amendment if it applies to your situation. The Tower Amendment was enacted to ensure that you will not receive a lesser amount of retired pay than you would have received if you had retired on a prior date, because of a recent retired pay cost-of-living (COL) adjustment. In the past, there were times where the retiree COL exceeded the annual military pay raise, which would have resulted in more pay, had the member retired prior to the COL date. The Tower eligibility date is usually the day prior to the effective date of an active duty pay increase. Tower pay is computed by utilizing the active duty pay rates in effect on that date, your rank/rate on that date, total service accumulated on that date, and all applicable cost-of-living increases. Since the E-8 was eligible to retire on December 31, 1999, Defense Financing and Accounting Services would also compute the entitlement as of that date. In this situation, this retiree would receive monthly retainer pay of $1791.00 since the Tower Amendment computations are not more beneficial than the current pay computation. If you have been found to be physically unfit for further military service and meet certain standards specified by law, you will be granted disability retirement. Military members with 20 or more years of active service can retire, regardless of the percentage level of disability, if they are found to be unfit and removed from the service by reason of physical disability. If you have a disability that is rated by the military disability evaluation system at 20 percent or lower, you can be discharged (most likely with severance pay, unless the condition existed prior to service and was not permanently aggravated by service or misconduct is involved). Those who are separated for disability may be eligible for monthly disability compensation from the Veterans Administration. If the condition is rated at or above 30 percent, and other conditions are met, you will be disability retired. Your disability retirement may be temporary or permanent. If temporary, your status should be resolved within a five-year period. The first method is to multiply your multiplier by your base pay or the average of highest 36 months of active duty pay at the time of retirement by the percentage of disability which has been assigned. However, the minimum percentage for temporary disability retirees will equal 50 percent. The maximum percentage for any type of retirement is 75 percent. The second method is to multiply only your years of active service at the time of your retirement by 2.5 percent by your base pay or the average of highest 36 months of active duty pay at the time of retirement. The third method applies to you if you were eligible to retire/transfer under any other law. DFAS will compute your entitlements using both methods above, and use the one which results in the greatest amount of retired pay. If you desire that another method is used, you may request it in writing. The difference between temporary and permanent disability is the stability of the medical condition. If your condition is not deemed "stable," you may be placed on the TDRL (temporary disability retirement list). When on the TDRL, you are subject to reevaluation every 18 months and limited to 5 years max on the TDRL. At the 5 year point, if not sooner during a re-eval, you are removed from the TDRL and either found fit, permanently retired, or discharged with severance pay. Don't confuse VA Disability Compensation with Military Disability Retirement Pay. They are two separate animals. The VA uses completely different standards for determining service-connected disability than the military uses for its disability retirement system. Even a rating by VA of 0 percent (although of no monetary benefit) documents your physical condition as service-connected. A rating by VA of 30 percent or higher allows you to receive additional tax-free allowances for your dependents. Annual cost-of-living increases to your compensation amount. VA disability percentage (and VA compensation) can be increased, based on a request and approval of reevaluation, resulting in increased tax-free compensation. The possibility of purchasing up to $10,000 of National Service Life Insurance without a physical exam. If you are awarded VA compensation, the gross amount of the compensation is deducted from your retired pay. You are not retired from the military for a disability. You are in a retired status and on the retired payrolls. Members recalled for more than 30 days to active duty are not in a retired status. You have 20 or more years of service for the purpose of computing retired pay. A reservist must have 7,200 or more points to qualify. The VA rating for disability of m70 percent or higher must be awarded within 4 years of retirement. The VA rating must be 70 percent or higher for each month. If the rating falls below 70 percent any given month, then the retiree has no entitlement to special compensation for that month. Unlike active duty pay, retired/retainer pay is only paid once per month. Your net retired/retainer pay should be sent to your financial institution by direct deposit unless you reside in a foreign country, which direct deposit is not available. Your retired pay will be deposited to your account on the first business day of the month following the end of the month. Your first payment for retired pay normally will arrive 30 days after your release from active duty, or, on the first business day of the month following the month of first entitlement to pay. In a separate mailing, you will receive a letter which will show you how your pay was computed. Any applicant who accepts employment with a foreign government without approval is subject to having reserve or retired pay withheld for the period of unauthorized employment. If you are retired and contemplating employment by a foreign government, you must obtain approval from the Secretary of the service concerned and the Secretary of State. If you retire from the military and are retired/retiring from Federal Civil Service, you can elect to waive your military retired pay in order to include your military service in the computation of your civil service annuity. However, for retired reservists, this is true only if you are service retired years of service or disability retired. If you are age retired (age 60) then there is no waiver or offset. If you choose to do so, you need to notify DFAS, in writing, at least 60 days prior to your planned civilian retirement date. It is suggested that you contact your civilian personnel office prior to the submission of your waiver request to ensure that you are aware of all the available options. If you elect survivor coverage from your civil service annuity, your military survivor benefit plan (SBP) participation will be suspended while you receive the civil service annuity. If you want to retain military SBP you may do so, but you must then decline survivor annuity from the Office of Personnel Management. If your pay is subject to court-ordered distribution, you must authorize an allotment in an amount equal to the distribution, in order to include military service in the civil service annuity computation. In most cases, retired pay is fully taxable. The amount of taxable income is reduced by SBP costs and any waiver for VA compensation or deduction for dual compensation (federal civil service employment). The amount deducted from your pay for federal withholding tax is based on the number of exemptions you indicate on either your pay data form or your W-4 after retirement. State tax withholding is on a voluntary basis and must be in whole dollar amounts. $10 is the minimum monthly amount. Before making your request in writing, you must contact the taxing authority in the state in which you have established residence to determine if you are required to pay state income tax. Retired/retainer pay is not subject to FICA (Social Security) deductions, nor is your retired pay reduced when you become entitled to social security payments. Additionally, under the provisions of the Uniformed Services Former Spouse Protection Act (USFSPA), state courts may treat military retired pay as joint property between the member and the spouse during divorce proceedings. Visit the DFAS website for more information. How Does Military Involuntary Separation Pay Work? What is the Temporary Early Retirement Authority? What Was the Military Food Stamp Program and How Was It Used?